SEATTLE--(BUSINESS WIRE)--Jun. 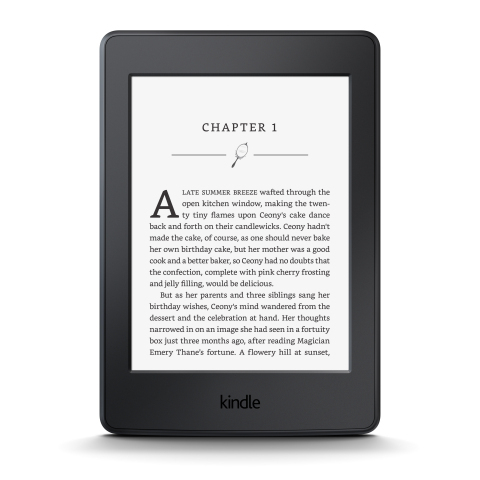 17, 2015-- (NASDAQ: AMZN)—Amazon today introduced the all-new Kindle Paperwhite, updating its most popular and best-selling Kindle with the highest resolution Paperwhite display, the exclusive Kindle font Bookerly, and a new typesetting engine for more beautiful pages. Meet the new Kindle Paperwhite at www.amazon.com/paperwhite. Kindle Unlimited—Enjoy unlimited reading of over 800,000 books and unlimited listening to a selection of thousands of audiobooks for just $9.99 a month. The new Kindle Paperwhite is $119. It is available for pre-order around the world and will start shipping June 30. Order now at www.amazon.com/paperwhite.